The Topps Company is pleased to announce that it has signed a multi-year exclusive spokesperson deal with one of the NBA's star players, Dwyane Wade. Over the last year, Wade has emerged as one of the most collectible basketball players in the trading card category as his superior on and off the court personality has resonated with fans and collectors alike. Wade's trading cards have become some of the most sought after collectible items in the industry. "It is an honor to partner with The Topps Company and their team of elite athletes and entertainers," said Dwyane Wade. The agreement, which comes on the heels of Topps announcing a spokesperson deal with Allen Iverson, grants Topps exclusive rights within the NBA trading card category for autographed cards, memorabilia cards and Wade's image use on packaging and advertising. "We are very excited to have one of the NBA's brightest young stars under our umbrella of exclusives," said Warren Friss, Topps Vice President. "Dwyane is an amazing player and we believe his trading cards will perform at the same level of his on-court game." Wade joins Allen Iverson, Hip Hop icon Shawn "Jay-Z" Carter and baseball players Alex Rodriguez and Barry Bonds as Topps exclusives. Wade, a guard for the Miami Heat, is one of the NBA's mega-stars. In only his second season, Wade helped lead the Heat to the 2005 Eastern Conference Finals averaging 27.4 points and 6.6 assists per game during the postseason stretch. The fifth overall pick of the 2003 Draft averaged 24.1 points and 6.8 assists per game in 77 contests last season. 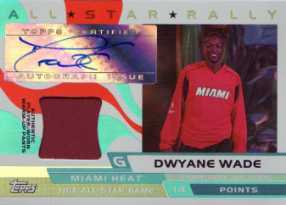 "Topps made a major commitment to Dwyane and is dedicated to developing high quality trading card products," said Henry Thomas, Wade's Chicago-based agent at CSMG International, Ltd. Founded in 1938 as Topps Chewing Gum, Topps issued its first basketball cards in 1957 and is an international marketer of entertainment products, principally candy, collectible trading cards and sticker album collections. Topps Internet business includes Topps.com, eTopps.com, TheToppsVault.com and thePit.com.